Â One of the first herbs to emerge in the spring is the chive. Chives impart a delicate onion flavor to any dish, and their vivid purple flowers create edible art when used to top a salad or add pizzazz as a pizza topper or colorful addition to a salad. The chive plant presents a neat, round shape that sports periwinkle blue flowers after the ground warms to 50 degrees in the spring. It is an easy to grow perennial that spreads like the chicken pox in a kindergarten class. Brown-thumb gardeners who want to feel successful can grow this herb with nary a care, and one plant soon becomes a dozen with little provocation. 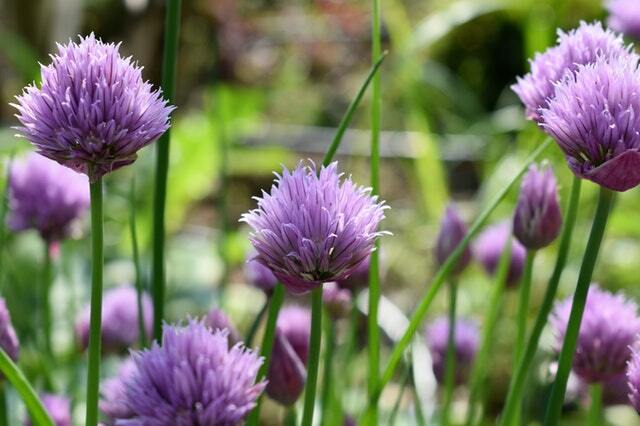 This rather vigorous nature can be both blessing and curse; in order to protect the kitchen garden or herb garden from a chive overrun, it might be necessary to contain the plant. Otherwise, plan on digging and dividing chives every other year. In the kitchen, chives are a natural companion to sour cream and potatoes, but a tablespoon or two of freshly chopped chives make a dandy addition to omelets, macaroni and cheese, or cream of tomato or potato soup. Sadly, chives don’t dry well, and the window for harvesting this herb is limited to about a month after the plants have emerged in early spring. After that time, the stems turn woody and inedible, and the flavor quality declines. Freshly harvested chives can be stored in the freezer; one trick is to place finely chopped chives in an ice cube tray, add either water or chicken broth to the tray, and freeze. Once the “chive cubes” are firm, they can be popped out of the ice cube tray, placed in a freezer bag and stored in the freezer for future use. Put butter into a medium-sized mixing bowl and allow to soften at room temperature. Add 1 cup chopped chives, and whip together using a mixer. Cover mixture and leave at room temperature. At the same time, thaw bread dough and allow to rise in warm place, approximately 1 hour. Punch down dough, and roll out into a 10 x 15 rectangle. Spread chive and butter mixture evenly over the dough. Roll dough into a loaf and seal ends. Place loaf on greased baking sheet and allow to rise until double in bulk, approximately 30 to 45 minutes. Bake according to package or recipe directions. This bread is best served warm.